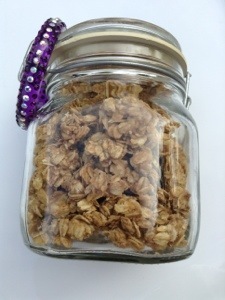 Does this bangle go with my granola? I’ve been welcomed into “retirement” in various ways over the past couple of days. My house, a pile of what used to be my classroom waiting for sorting, trash, or storage in the garage. My mother (who hates that accolade), a rhinestone purple bangle (apparently in response to my previous post). My grandma, a beautiful rose-bush that made me think of the Janis Joplin ballad. My sons, rambunctious excitement over, well, I’m not sure they know other than change in routine. Today felt like what I imagined it would. Meant to wake at 6:00 to have time for gardening, instead I woke at 7:00. Feed the baby, make breakfast, get everyone ready, clean up from breakfast, feed the baby, beeline to the grocery store, lunch, naps, handwriting practice, and a few minutes in the kitchen with Kiddo making granola for the week’s breakfast. It’s so simple to make, and a great starter recipe for kids who want to cook. Plus, once you find a base recipe, the variations are endless. Here’s two of our favorites. They both bake at 325, so that makes multi-tasking super easy. Save yourself some time during clean up – cover your sheet pan in parchment paper or foil with nonstick spray. Preheat oven to 325 degrees. In a bowl, combine the oats and cinnamon. Combine peanut butter and honey in a microwave safe bowl and heat until peanut butter melts. Stir so honey and peanut butter mix well. Stir vanilla into peanut butter and honey mixture, and mix very well. Add to oats and stir until oats are completely covered in peanut butter mixture. Spread out oat mixture onto prepared cookie sheet and bake for 15-20 minutes or until granola is slightly browned. Let cool completely before storing. Homemade Granola from You Made That? Preheat oven to 325 degrees. Combine the oats, nuts, and flax meal in a large mixing bowl. In medium saucepan, over medium-low heat, melt the oil, brown sugar, honey, and salt stirring until the sugar dissolves. Remove from heat, add the vanilla, and stir well. Pour the sugar mixture over the oats and stir well until combined. 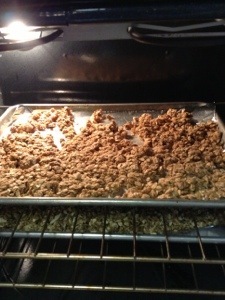 Spread out oat mixture onto prepared cookie sheet and bake for 15-20 minutes or until granola is slightly browned. Let cool completely before adding dried fruit and storing. It should store in an airtight container for two to three weeks. Granola freezes well. One thing to keep in mind, granola is concentrated energy. A little goes a long way. 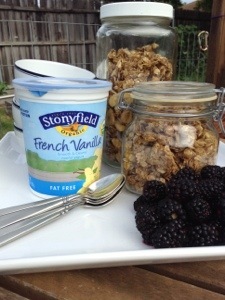 I like to serve granola with yogurt, but I wouldn’t put it past me to use it with some of the berries we picked up for an impromptu blackberry crisp – or later in the summer, a peach one – or with apples in the fall. Oh! or the peanut butter one with some chocolate chips and mini marshmallows for s’more granola mix. It’s a great crunch of texture on top of hot oatmeal. You could throw it onto some greens, especially with a sweet vinaigrette. I know…I get a little carried away. Any way, back to cooking this afternoon with my son. Oats all over the kitchen – silly – delightful. I could take food writing classes (do they have those?) for years and could not describe food the way he does. Today’s was simply a, “mom, that tastes just perfect”. Not the best example. Then Man came home, little ones woke up, and except for a surprise dinner party, business went on as usual. I could get used to this. Btw – I think the bangle compliments my sparkly pink toenails. « Where do these kitchens exist?